Ubuntu 10.10 has a file called Wubi.exe (Windows Ubuntu Installer) on its desktop version of its operating system install CD. Wubi is a very easy to use installer to install Ubuntu on to your Windows computer. You can use Wubi.exe to install Ubuntu like any other Windows program like a web browser. Wubi is basically point and click, and filling out your username and password. I’ll show you how to install Ubuntu 10.10 with Wubi and create a dual boot computer in Windows without the hassle of repartitioning your Windows hard drive to install Ubuntu 10.10 on to it. If your computer has a 1Ghz CPU, 512MB of RAM, and 5GB or more of free space it should run Ubuntu 10.10. 1. Put in your Ubuntu CD in Windows, and go to computer and click on the wubi.exe icon. 2. 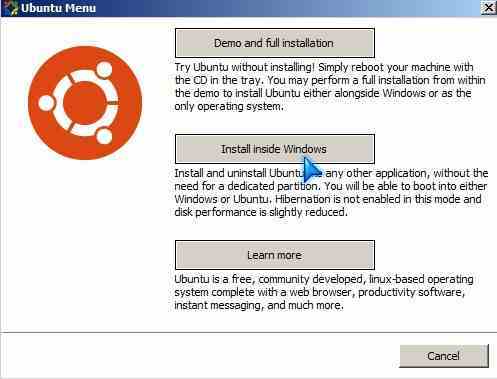 Cick the Install Inside Windows Button on Wubi Ubuntu menu. 3. 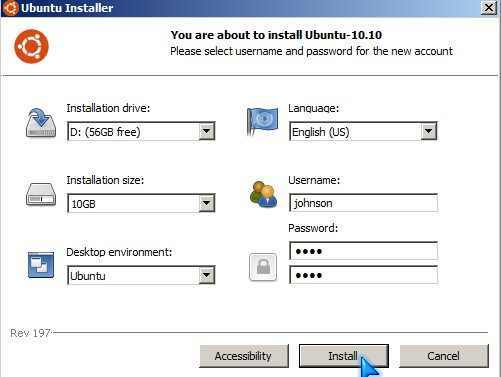 Fill up the form for the Ubuntu installer. I recommend 10 GB or more of space for the installation size just in case you want to install more programs or copy some files to Ubuntu in the future. 4. Wait for the install to be done. When you restart your computer you see a start up list screen which is black. Don’t worry your computer is fine. Windows is on top, and Ubuntu is on the second line. Press the down arrow key on your keyboard and click enter. You’ll see another black screen again. 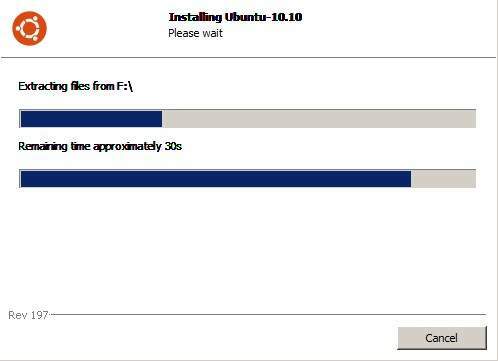 You can just click enter or wait for the screen to finish counting down then Ubuntu will finish the install. 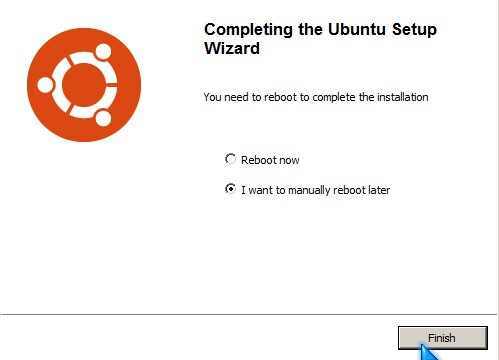 Congrats, now you created a dual boot computer where you can start Windows and Ubuntu on the same computer. I been using Ubuntu 10.10 for over a week, and it works great. It starts up a lot faster then Windows 7, and seems more responsive on slower computers like my older computer with a 1.8 Ghz CPU and 1GB of RAM. Ubuntu 10.10 works great as a basic office, multimedia, and internet computer when you install Adobe Flash player onto Firefox for Ubuntu 10.10.